​We know you will be full of questions about the experience and practicalities of going to the Sahara, so we want to help address some of them already and reassure you that the trip is both affordable and safe. During your week -stay in the camps, you will be looked after by a Sandblast ambassador who will help oversee the programme and facilitate your translation and transport needs. You will live with a Saharawi refugee family and be well looked after. Don’t worry, you will have a wonderful time! To participate you need to register by providing a £100 non-refundable registration fee and filling in a registration form by December 15. This amount is deducted from your final payment, which is due on January 15. Visit our HOW TO REGISTER section to learn how to join Run the Sahara in 5 easy steps! Where does the Sahara Marathon take place? It takes place in the Saharawi refugee camps located near Tindouf in SW Algeria. When does the Sahara Marathon take place? It takes place every year around the last week of February. The exact dates vary a little from year to year. They are set by the main organisers in Spain and the camps and we do not usually know the final dates until four or five months prior to the event. You fly out a few days before the race date and stay for a few days after the race. How do I deal with visa and flight tickets? Sandblast will deal with your visa and travel arrangements. This is part of the support we provide. Everyone going from Spain travels on a group visa. How do I get there? You will fly to Madrid. This is the only leg of the trip we do not organise. Once at the Madrid airport you will meet your “Sandblast Ambassador” and join the Spanish contingent participating in the Sahara Marathon. From Madrid you will fly on a chartered Air Algerie flight to Tindouf, in SW Algeria. The flight is about three and half hours. What happens when I arrive? 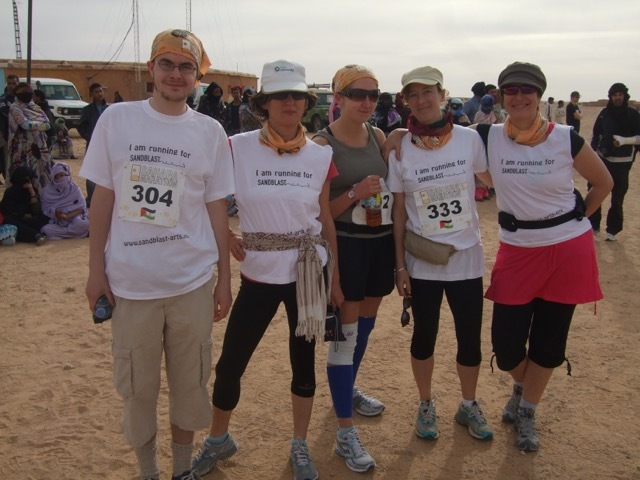 Once in Tindouf, you will be met by the Saharawi authorities and Sahara Marathon organisers at the airport and be driven to Smara, one of the four camps where the Sahara Marathon race is hosted. Where will I stay? Once in Smara, you will be collected by your host refugee family at a central gathering point. You will live with a group of 5 to 6 other UK participants. We will try to ensure that friends and family stay together. Staying with a family will offer you a unique chance to experience the legendary hospitality of this exiled desert culture and learn about their lives and stories of the refugees. What is the accommodation like? It is basic and clean. Mattresses, pillows and blankets are provided. If you like to sleep in sheets bring your own and also towels. Washing facilities exist but again are quite basic. There are toilets that often double up as shower rooms. You will be able to wash from buckets of water. You can ask your hosts to heat up a water in a water if you can’t face washing with cold water. What will we eat and drink? You will mostly eat with your Saharawi hosting families.The food is fine and sometimes even very good depending on the talent of the cooks! There will be food for vegetarians and meat-eaters but a lot of the food consists of pulses, pasta, rice and potatoes. ​A pasta party is held on the night before the race. You will be given plenty of bottled water on the day of the race as required. Water and drink are often provided by the host families but as they are quite expensive we suggest putting together a kitty to contribute towards drinks and buying in shops nearby. How do we get around? You will initially travel in buses prior to the race date to get from one place to the another and then after wards, depending on the size of the group , in several 4X4s and on foot for locally- based activities. The transport is provided by the Saharawi authorities which are largely donated vehicles. Local taxi known as passage also exists for the more adventurous. You pay 200 dinar to travel between camps. What do we do before and after the race? Prior to the race date you will spend time settling in and preparing for the race. During these days you will mostly follow the general Sahara Marathon programme. After the race day the activities will be organised by Sandblast. These will include meeting local figures in different sectors of the society like women, youth, artists, seeing schools, hospitals and interesting projects and participating in fun interactive activities to learn more about aspects of Saharawi culture and society.